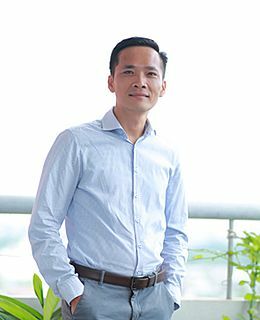 Send a trip enquiry to this agency Tuan’s team speaks English and specialises in tailor-made tours. With a customer-first mindset, our local agency always makes a huge effort to ensure that our customers are happy and that they have the most incredible trip possible. We want each traveller to South East Asia to be able to appreciate the beauty, culture, and history of the fascinating place we call home. 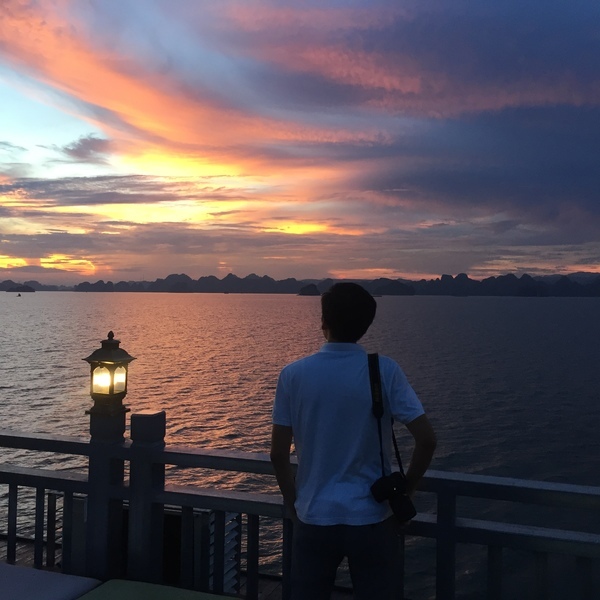 The local expertise of all the agents in our team means we are able to advise on not only the highlights of Vietnam, Cambodia, and Laos, but also the lesser-known local hot-spots and hidden gems of these countries, all while proposing personalised travel experiences adapted to each individual traveller. Meet the friendly specialists at Tuan’s agency. Let them know what type of trip you'd like and start customising your perfect tour. Browse Tuan’s customisable tour ideas. This is the perfect journey for travellers who seek an introduction to the heritage of Vietnam and Cambodia. You will visit two of the main sites of the region, protected by UNESCO. 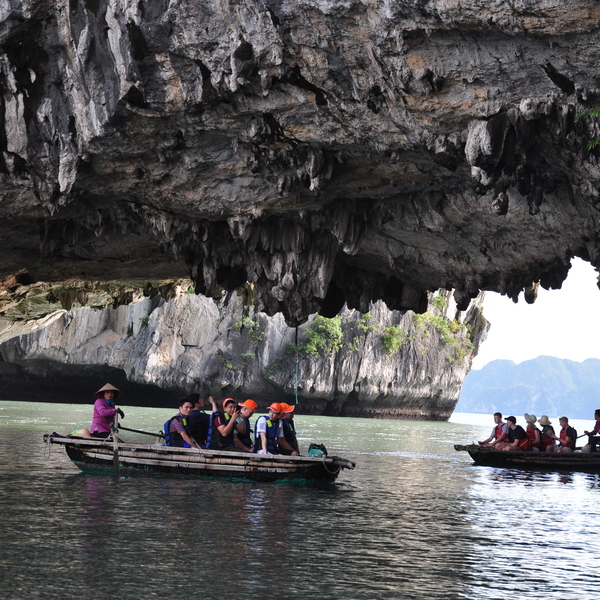 You will enjoy a cruise on Halong Bay, dining in a cave and kayaking among its incredible rock pillars. Angkor Wat will best reveal its secrets at sunrise, and an expert guide will show you the marvels of Khmer temples. In between these breathtaking experiences, you will have some time to discover celebrated Hoi An. Local experiences, villages and markets are also on the menu. This tour will give you a complete overview of our countries! 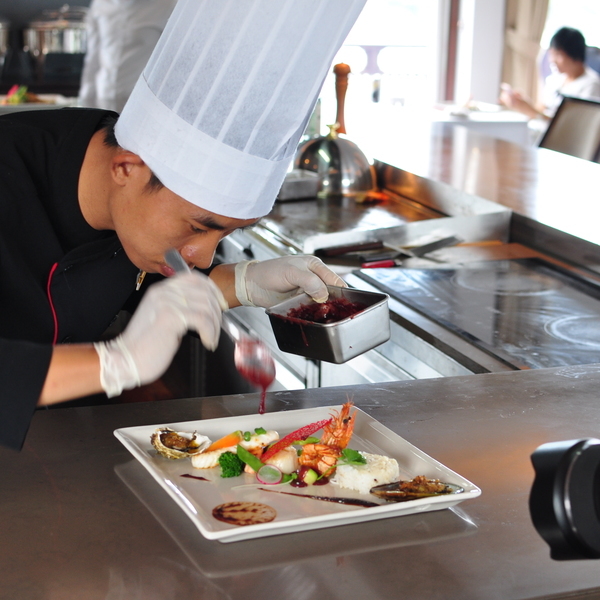 Vietnam is known as being one of the world's best places for foodies. Here, you can sample delicious, fresh seafood almost everywhere you go! Kayak through a hidden lagoon or enjoy a sampan boat trip through a floating village. 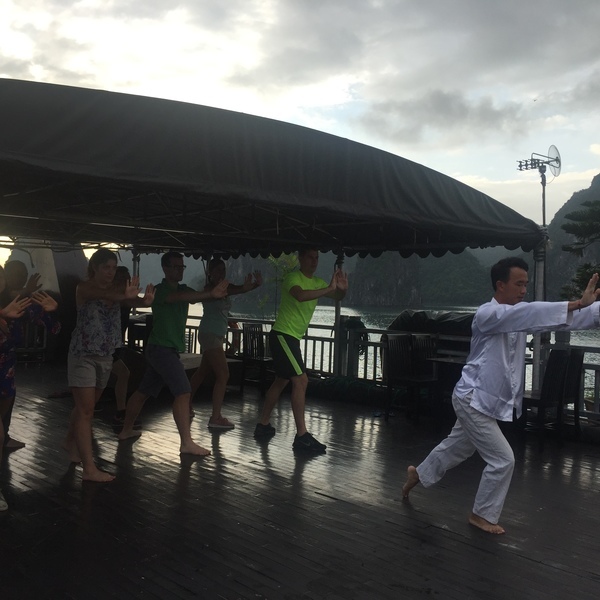 Why not wake up like the locals and try a Taichi lesson on the sundeck? Enjoy sunset from the sundeck of your cruise boat in Ha Long Bay! Our agency operates a minimal impact and sustainability policy to guide our development and operations. Vietnam is a big country from north to south, so we employ local (English-speaking) guides for all our tours. They were born here and live in the area, so they know Vietnam better than anyone else, and it also ensures that a portion of the revenue from our trips stays in the local economy. We also use accommodation and restaurants in small villages run by locals wherever possible, encouraging our guests to engage with the local people in the areas where we visit. We also aim to use local produce from the communities we pass through during our tours. We loved the entire trip. our favorite area was Hanoi and Han Long Bay. We loved how Sen called us at each location to check in and make sure things were going ok. All of our drivers and guides were great. We enjoyed the Vietnamese people all were so friendly. Can't say any part was bad. We were surprised at the amount of trash on the road side and rivers and hope the next generation of Vietnamese people will clean things up! Our arranger listened to my requests and tailored a tour that exceeded my expectations. We felt our visit benefitted local people but wasn’t exploiting. I didn’t find the communication platform easy. In particular I struggled to find what i had written. The trip itself was great. Our guides enabled us to see very popular tourist destinations without tourists! We visited Cambodia and Vietnam going to the main cities as well as venturing inland to visit some rural communities.